An excellent release, maybe among their best to date, this single features three great surf instros from the sporty Krontjong Devils, and one amazing vocal "Land Beyond The Moon." This fine Dutch band has released sometimes marginal material up to now, often more on the trash side of the aisle. With this single, they have shown the quality of their writing and playing in four well recorded tracks. Very cool! 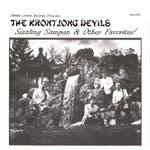 The Krontjong Devils took the high road with Oriental themes, avoiding the trite and developing something that has the feel without the sameness. The surf is cool, the bamboo green, and the melody interesting. An excellent track. Fast and surfy, "The Rafter" sports the pace of a Boss Martians instro with more splash. Adventurous and fit for a 65 MPH romp down 101. very cool. "K-2" is a slow, almost funeral like track. The moody organ gives it a churchy feel, while the splash of the reverb tells of surf tragedy. Quite a cool tune.